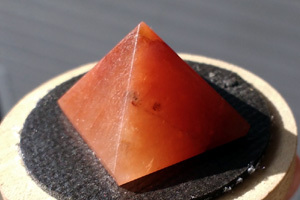 Red Aventurine Gemstone Pyramid for Sale. Small Red Aventurine Gemstone Pyramid as Capstone for Copper Meditation Pyramids. Heart (Center). Aventurine is a stone of prosperity. It reinforces leadership qualities and decisiveness. Promotes compassion and empathy. Encourages perseverance. Aventurine relieves stammers and severe neuroses. It stabilizes one’s state of mind, stimulates perception and enhances creativity. Aids in seeing alternatives and possibilities. Calms anger and irritation. Promotes feelings of well-being. Aventurine balances male-female energy. It encourages regeneration of the heart. Protects against environmental pollution. Aventurine benefits the thymus gland and nervous system. It balances blood pressure and stimulates the metabolism, lowering cholesterol. Aventurine has an anti-inflammatory effect and eases skin eruptions, allergies, migraines, and soothes the eyes. It heals lungs, sinuses, heart, muscular and urogenital systems.